I am making a French(-ish) roasted chicken for Sunday’s dinner. My original thought was to make a carrot soup, but daughter Miriam requested a carrot salad instead. Looking at French carrot salads on-line, I found that I did not have fresh parsley and Miriam cannot eat onions at the moment. I had dried chervil—A.K.A. French parsley—and I decided to substitute currents for the onions. 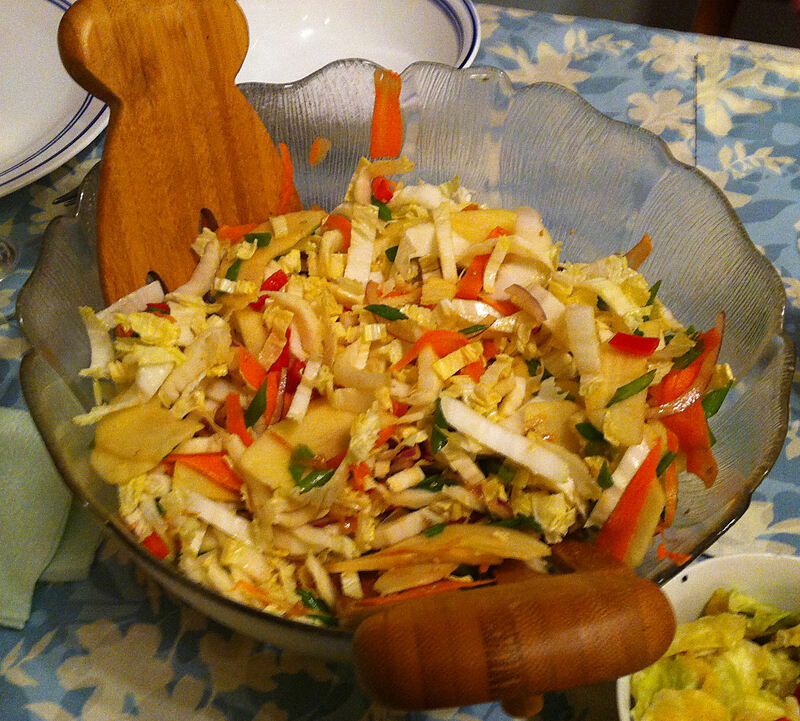 Wife Jan is very fond of carrot salad. I am making barbecued chicken and Jan has requested a carrot salad to go with it. While the seasoning of the bird is “mostly” French cuisine, I decided to use a more Japanese dressing on the carrot salad. That’s called California Fusion. Last week, I made Uyghur bierocks for dinner. 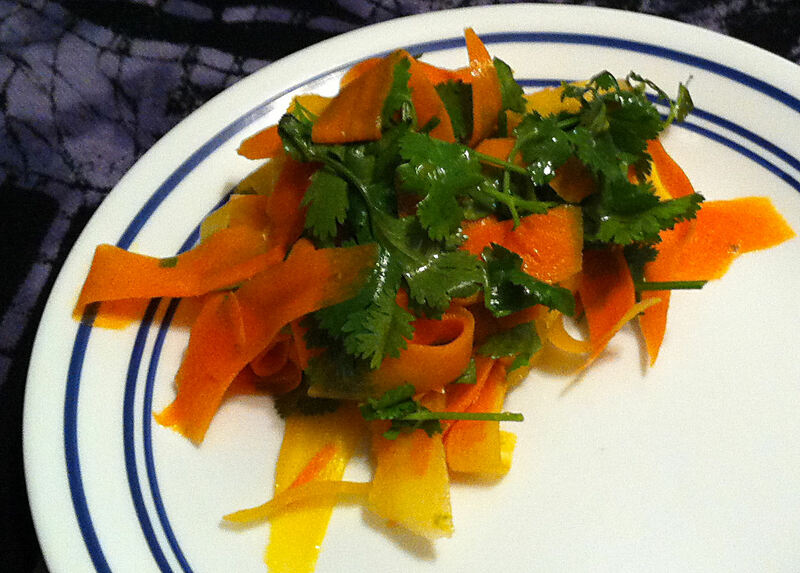 I made some Uyghur carrot salad to go with it. However, I got a bit heavy handed with the Indian chili powder. My salad was so spicy not even Eilene—who has a high tolerance for such things—could eat more than a few bites. I had decided to make a Japanese feast this Sunday. 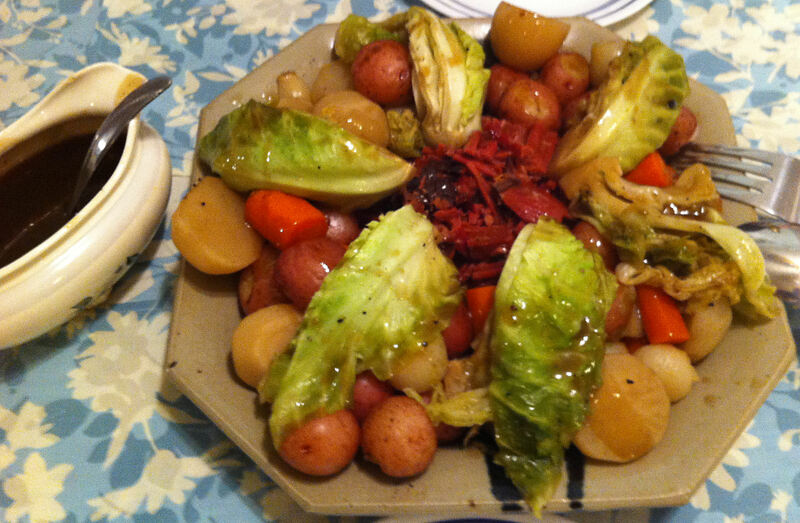 Miriam had requested that it be a vegetable forward and a low sugar meal. Japanese dishes seem to have a lot of added sugar, but I could work with that. I found a site with a list of nine Japanese vegetables dishes to go with my main dish of chicken yakitori. Once again, Eilene is having friends over. I decided I would make chicken teriyaki and rice. I wanted to make a side dish, but it was too late to make pickles. 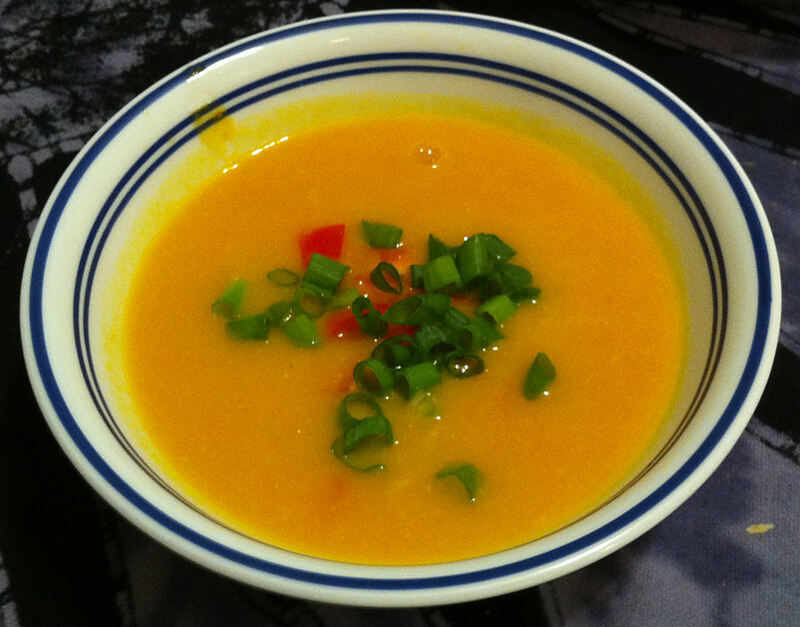 I have been making blended soups lately, so I thought I would make a carrot soup with an Asian twist. I wanted a side salad to go with my Moong dal with shrimp. Just Miriam is joining us for dinner this Sunday, Chris is off to New York for the week. She is on the Atkins diet, so I still have to adapt my cooking to her desires. 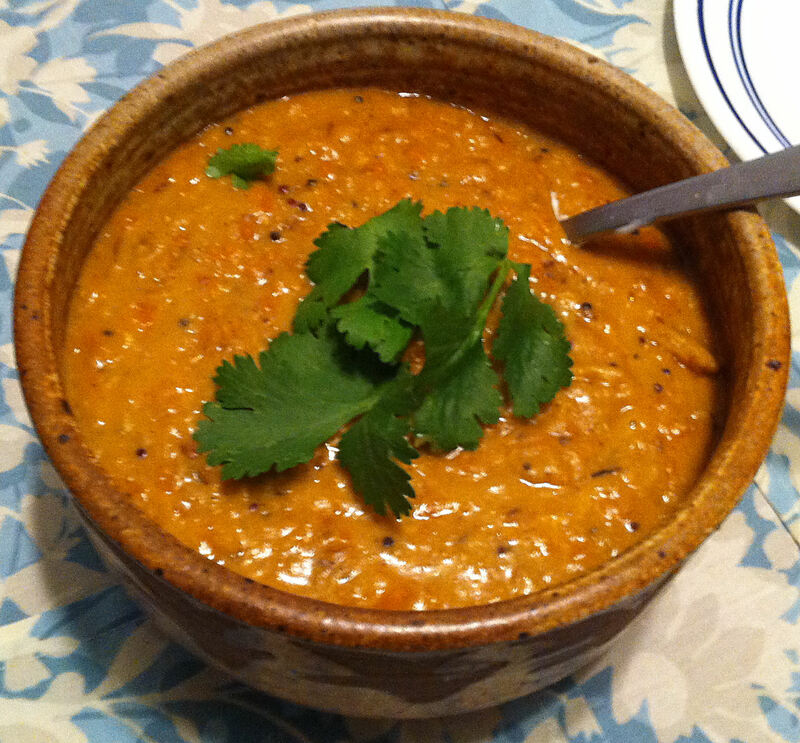 She is entering Phase two, so I thought I would make a dhal to go with my chicken curry and palak paneer. This seems to be my week for trying to improve recipes I have made recently. Last week I made an Asian influenced salad to go with my salmon teriyaki. I am making salmon again and the salad was good enough that I wanted to try and make it better.